I know better but I still fell into the trap. I spent hours deciding on the perfect gift for my grandkids. Very early on I had purchased some of the longer wood blocks that would expand their block play greatly. I knew this was a good choice but ….. I kept having the nagging feeling of wanting to get the “perfect” gift that would bring a huge smile and squeals of joy. Then came my fated trip to Toys R Us. I haven’t been there in a long while but I new they had Calico Critters and Anna is at a great age for enjoying these cute little play animals. To my surprise and delight, they were even ON SALE! All this contributed to my admittedly “Grammy Gone Wild” moment. As I wrapped the gifts I actually decided to hold a couple of things back for birthdays but truly, I gave more than I originally intended. I told myself, “This one more thing will be so much fun.” I fell into the trap of thinking that MORE is BETTER. And yes, to be fair, Anna enjoyed the Calico Critters (which she called Little Creatures.) She and I exclaimed over all the little accessories that came with her tree house. (I apologized to her parents for creating a hard situation with all those little things in a house with an active, soon-to-be one year old.) But, Anna loved it all! Yes!! I did it! Children most importantly want their parents’ (and grandparents’) attention, involvement and time. By the way, I gave Anna my presence too. Here’s a glimpse at our Christmas in the classrooms. 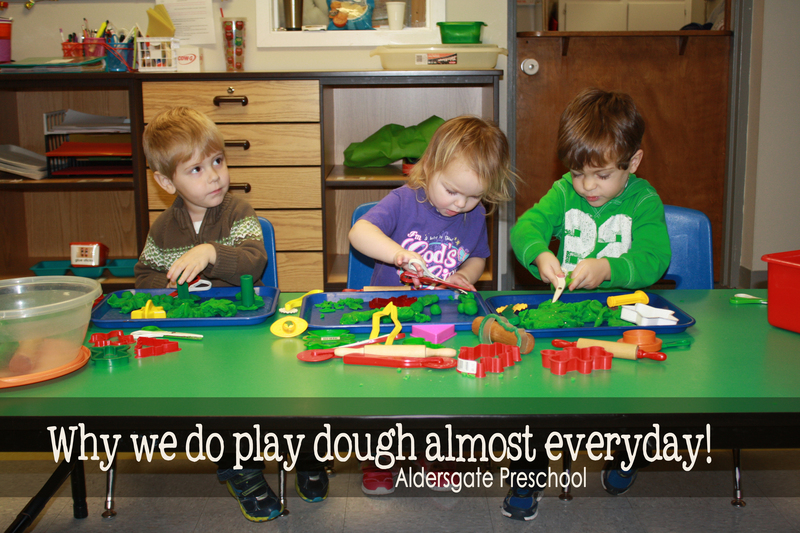 Why do we offer playdough play almost everyday? 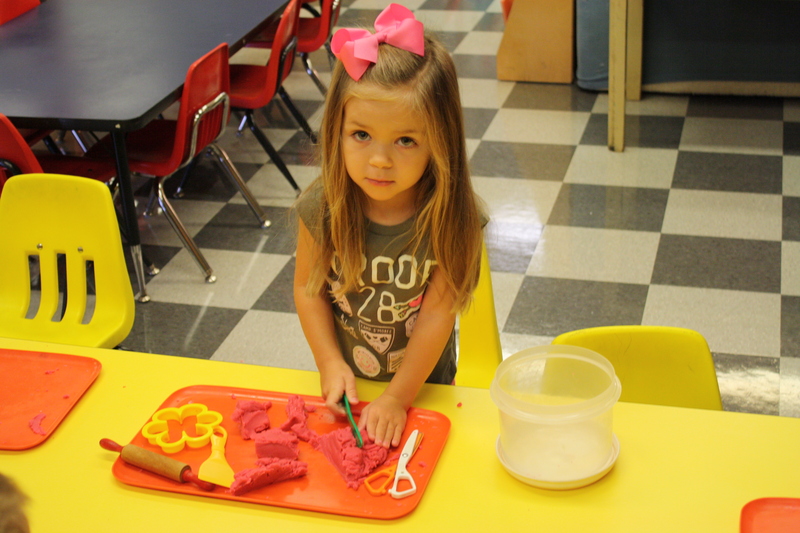 If I had to list the top ten items necessary for an enriched learning environment, play dough would definitely be on it. It might even be my number one. (Well, maybe books, music, blocks . 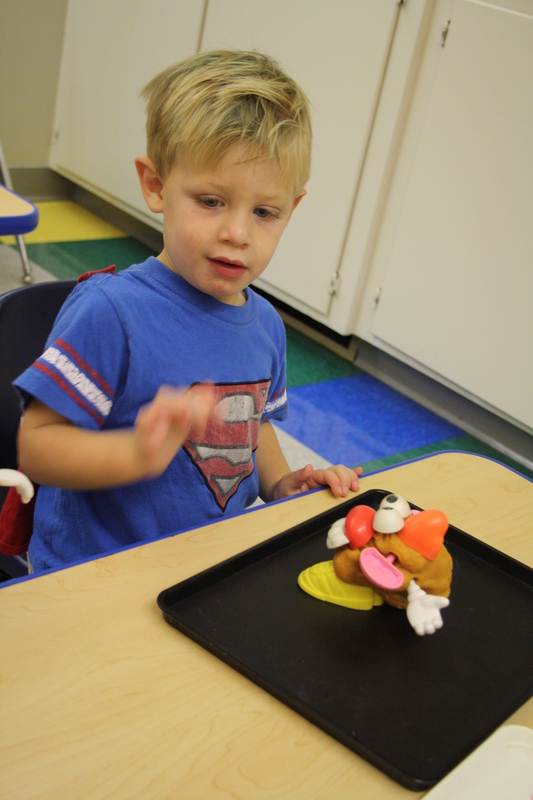 . . but, today’s post is about play dough.) I’m posting this during the Christmas shopping season to give another option for a fabulous Christmas gift. 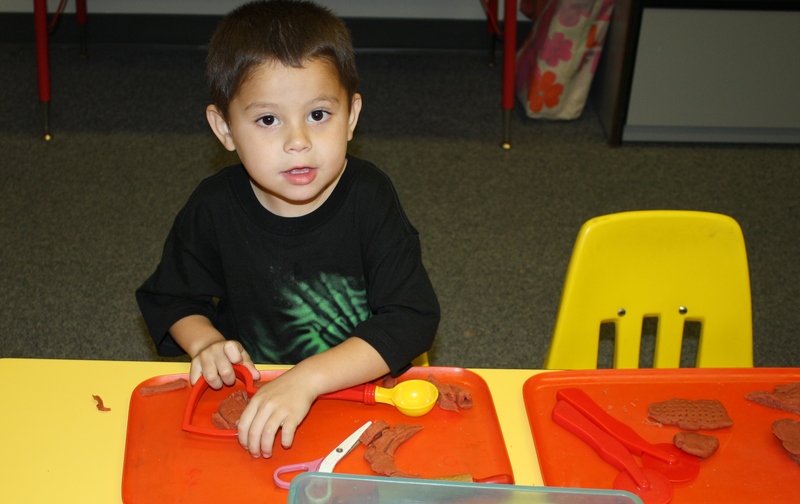 Some play dough and utensils in a sturdy container would make a great gift. As an adult, let me just say, I do not prefer the store-bought play dough. Um, no, actually I can’t stand the store-bought play dough. The two things it has going for it are the bright colors and the smell. (I still love that smell.) Let’s face it though, it is fairly stiff and VERY crumbly (read messy.) All of the play dough we use at preschool is homemade. It is pliable, keeps for a long time (if tightly sealed), and can be made with a variety of scent, color and even texture. Here is the recipe Ms. Michelle uses. A little prep in the set-up is another crucial element for less-messy play. We always use our play dough on plastic trays. At home I would use a shallow cookie sheet or a large rectangle lid. A child sized table would be helpful for children to be able to work the dough with more control (this equals less mess.) The right flooring underneath is important. PLAY DOUGH IS NOT A CARPETS’ FRIEND. (Hint: If it does get into the carpet just let it dry completely and then scrape at it with the side of a scissor blade. It will should flake right out.) Smooth floors that can be easily swept are best. As with carpet, it is easiest to just let play dough sit till it hardens and then sweep it up. When the weather is nice consider taking the play to a table outside. If you don’t have these options a plastic shower curtain or vinyl tablecloth under the whole play area should work well to collect any dropped pieces. Now, for my campaign to promote play dough play. 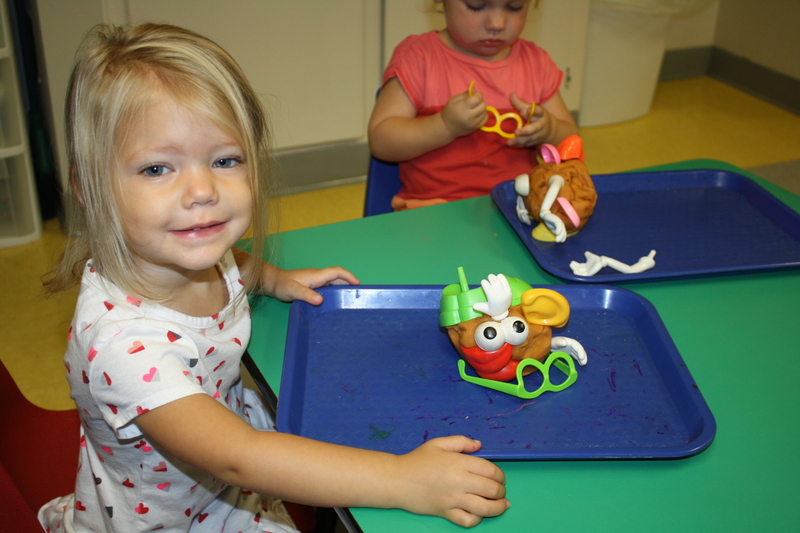 While working with play dough children support the development of many growth areas. rolling pins * scissors (regular kids scissors work great) * pizza rollers * kitchen tools such as potato mashers, whisks, melon ball tools, etc. 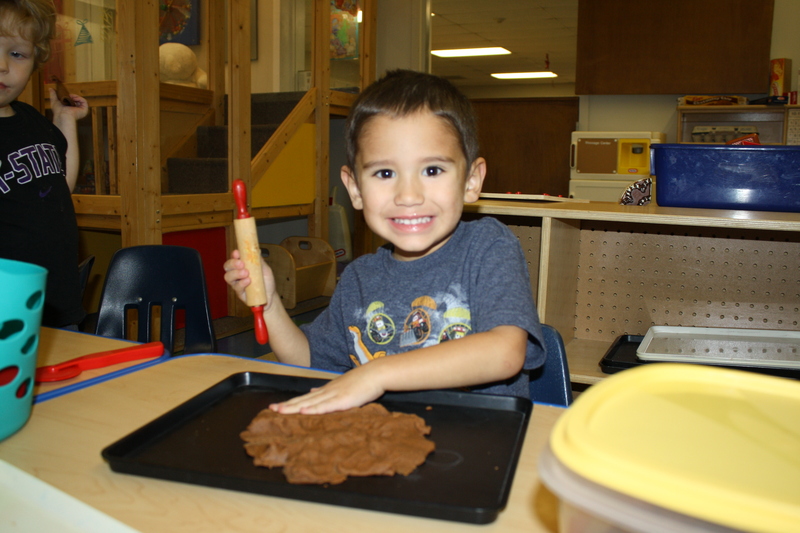 * cookie cutters * straws * birthday candles * popsicle sticks * pipe cleaners * any item that would make an imprint (such as those wood alphabet blocks * Mr. Potato Head pieces * googly eyes * buttons * toothpicks . . . . . The last picture here is of my granddaughter. I couldn’t help sharing it. 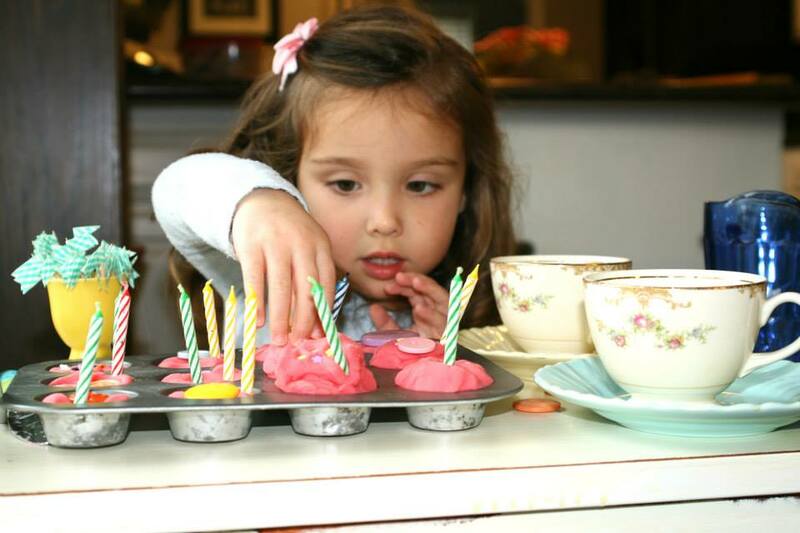 We had a wonderful tea party using play dough to celebrate her baby’s birthday. 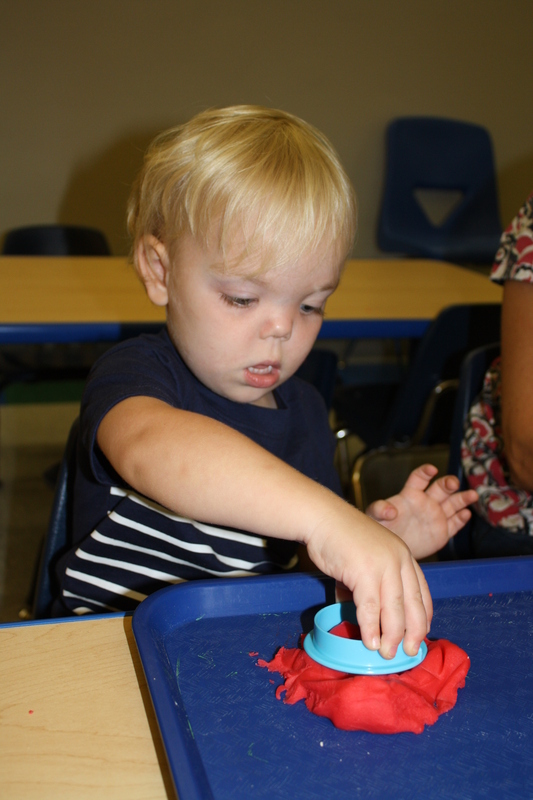 Here is a great blog post with a lot of other ideas for expanding the traditional play dough play. Take a look back at the first sentence of this post and you will notice I mention the importance of play dough for kids. I almost used the words “young children” or “preschoolers.” I specifically decided to use the word ‘kids.” I did that because I believe that children of all ages (by that I mean ages 1 – 100) can also enjoy all the benefits I’ve talked about above.. So, grab some dough and some “tools” and start squishing, pulling, rolling and CREATING! We are making lists. We are all searching for the perfect gift for everyone on our list. We hope we can find toys for our kids that are exciting and fun! We also hope we are giving them gifts that will sustain their interest, encourage creativity and cognitive thought, last as a go-to toy for years to come and so much more. Personally, I also look for toys that don’t include batteries. Toys that are child driven. With tomorrow being Cyber Monday I wanted to share a few ideas that might just be on sale then. Click on the photo for the link to one site where you can purchase the item. You may want to shop around tomorrow to see if another site is offering it at a lower price. Here’s a list of some that I would recommend. DOLLS (soft body and no noises) This one is from Melissa and Doug. I have found this company to carry very quality and interactive toys for all ages. STROLLERS & GROCERY CARTS Little Tykes brand has held up well for us. CARS (again, no noises and fewer moving parts) These are sturdy and the kids will love pulling them back to watch them zoom forward. BALL TOYS I was surprised to see how many of these now have music and other sounds. I would opt for a more basic option. WOOD BLOCKS: These would definitely be my top 10 list of toys for kids! For those of you worried about how to store these, we keep them in an old suitcase that even looks nice in my livingroom. Afraid your girls won’t like them? Consider adding some furniture or characters. SQUIGZ: I always try to include some things that are new. There are always such neat new toys! These look very interesting and have gotten great reviews. (We don’t have these yet but you can be sure they are now on our preschool list for future purchases.) This link is to the deluxe set (as with most things, I’m think you need enough to make the play really fun) but there is a starter kit as well as other extending sets such as Squigz Benders that look interesting. 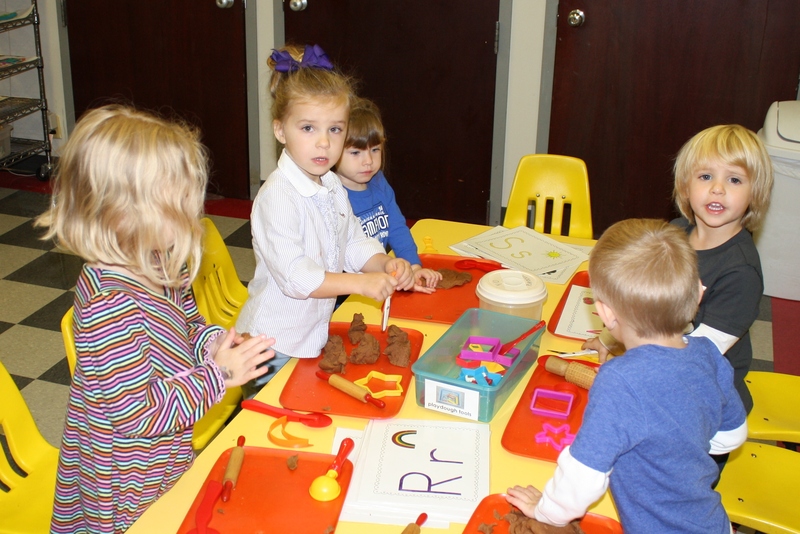 MARKERS, CRAYONS, CHALK We encourage the children to use pipsqueak sized items. The shorter length encourages the children to hold the item closer to the writing area which applies the most successful amount of pressure. Do-A-Dot Art Daubbers Kids of all ages enjoy these – and they are very low mess. PAINT, WATERCOLORS, FINGER PAINT I know, it’s messy, but it is so worth the risk of a little spill. Purchase several of those cheap vinyl table cloths to put under your child’s chair while he or she creates. These are from Lakeshore Learning. I like their items however we purchase most of our art supplies from DISCOUNT SCHOOL SUPPLY. COLLAGE MATERIALS A collection of different papers, ribbons, buttons, pipe cleaners, rhinestones, google eyes, tongue depressors, and more can supply hours of fun! KINECTIC SAND This wonderful feeling sensory material molds well without being wet. It never dries out. REAL WORKING CASH REGISTER I think the name says it all for this one. DOCTOR KIT If you don’t already have one, you need this. MAIL BOX This was popular while it lasted at preschool. 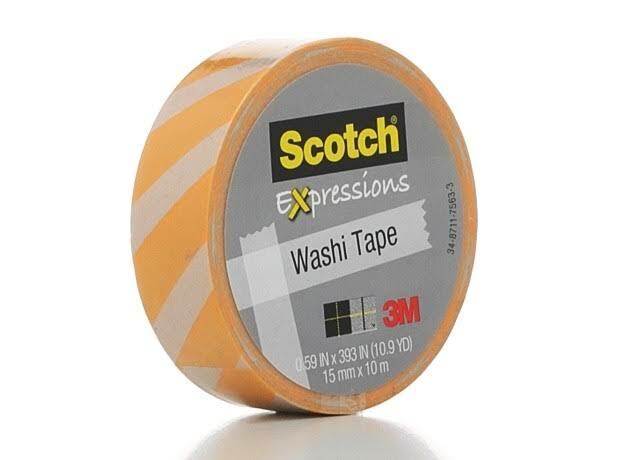 Hopefully with less continuous use it would hold up to your children’s wear and tear. In addition to the traditional games such as Candyland and Hi Ho Cheerio we have a few we especially enjoy. TEDDY MIX & MATCH There are a variety of ways to adapt this game to various ages. I began using these in play with my granddaughter when she was just two years old. I will do a blog post soon with ways to adapt toys and games like this one. MAISY GAME This game encourages children to find their different color items to fill their board. 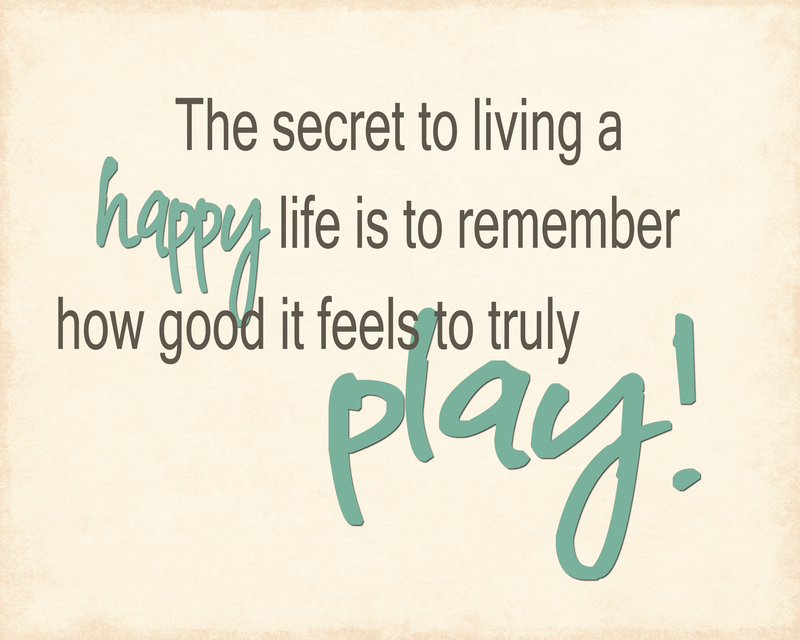 We also play it a variety of ways. Watch for that blog post soon. OH RATS! This is an old Discovery Toys game – it’s worth the hunt. Every person has a puzzle with one piece of each color. If your spinner lands on a color you have already filled you get to yell, “Oh rats!” It helps a child handle the disappointment of not getting to fill another piece. SPOT IT JR I haven’t played this game but it seems like it would encourage visual discrimination at an appropriate level for young players. While I was researching for this post I came across a couple of games I would heartily endorse for older kids. I couldn’t resist including them. TUNNEL This pop up tunnel is always a hit when we get it out at preschool. It would be great on those long winter days. TRAMPOLINE While we don’t have this specific model, a trampoline that can be used indoors is a great way for children to continue building hose large motor muscles throughout the cold weather and all year long. BILIBO We don’t have these yet but they are on the list. They look really interesting. There is a video tab to see a whole host of uses for this unusual toy. Hopefully you’ve gotten a couple of ideas from this post. Happy Shopping! Categories: Misc, Parenting, Uncategorized | Permalink.